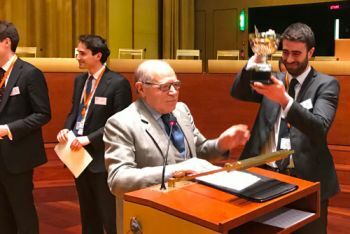 City Law School students have won the 2017 European Law Moot Court Competition at the European Court of Justice in Luxembourg before judges and advocates-general of the Court. The City Law School mooting team has won the 2017 European Law Moot Court competition. The finals of the competition took place on 31st March at the European Court of Justice in Luxembourg before judges and advocates-general of the Court. The team comprised Bar Professional Training Course student Margherita Cornaglia, and Graduate Diploma in Law (GDL) students, Ben Lewy, Miguel Rodriguez-Correa Henderson, and Douglas Grant. The European Law Moot Court competition is a very rigorous and competitive moot, which attracts competitors from the United States and Europe. The team was extensively coached by Niall Coghlan, a City Law School (GDL) alumnus and barrister, and winner of the 2014 European Human Rights Moot. 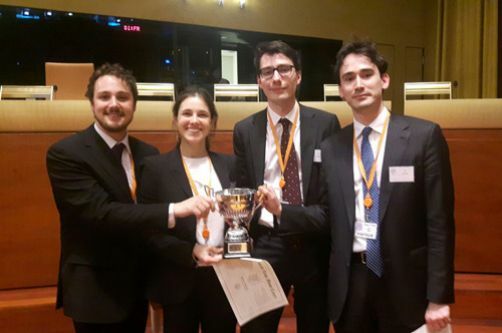 “We are very proud of the success of the City Law School team at the European Law Moot Court Competition. Their achievement is a testament to their talents, hard work, and determination. It also tells us a lot about the enthusiasm that the study of EU Law still generates amongst students at this critical time”. “Ben, Douglas, Margherita and Miguel have done tremendously well to juggle their preparation for such a high-level competition alongside other priorities - study, applications, interviews, and pro bono work. To top it all, winning the competition is an incredible achievement! It's been a very exciting year for mooting at the City Law School and we look forward to the 2017/18 season”. The European Court of Justice (ECJ), is the highest court in the European Union in matters of European Union law. As a part of the Court of Justice of the European Union it is tasked with interpreting EU law and ensuring its equal application across all EU member states. The Court was established in 1952 and is based in Luxembourg.